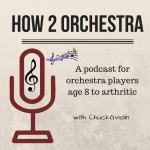 How 2 Orchestra – my new podcast which deals with how to be successful playing in a symphony orchestra will launch sometime this summer. Show notes for the podcast will be here so you can follow along. Important links, resources, and other paraphernalia will also be here. For now, you can read my blog as you prepare for the audio extravaganza coming your way soon.